The World Resources Institute (WRI) has put a new spin on the familiar SWOT (Strengths, Weaknesses, Opportunities, Threats) analysis. In partnership with companies in WRI’s Next Practice Collaborative (and through workshops, road tests, and interviews with dozens of companies and sustainability experts) the team has already put the sustainability SWOT (sSWOT) into motion in a few businesses already and has seen great success. The graphic above (click to view larger) comes from WRI’s “sSWOT” site and provides a good snapshot of the guide that has been recently published and is now available to download. 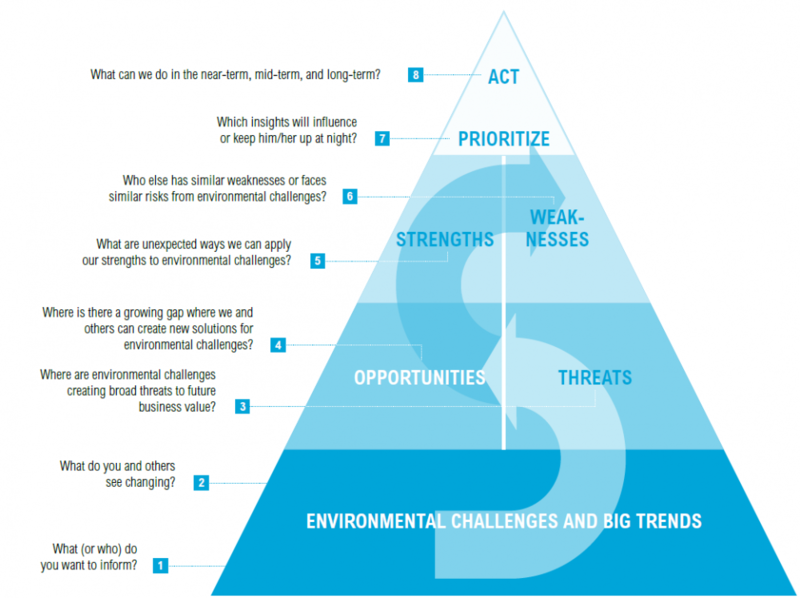 The sustainability SWOT (sSWOT) is designed to help drive action and collaboration on environmental challenges that create real business risks and opportunities. It helps individuals engage and motivate colleagues—particularly those with limited knowledge of environmental issues or corporate sustainability. Use this guide to work across internal departments–as well with suppliers, customers, or other stakeholder–on strategies to create and sustain long-term value. Trends: It is essential that companies be aware of trends in society. Whether these are long term or short term trends, on a large scale or small, these determine your consumer market. It is also important to be observant of trends across a myriad of business sectors. Environmental Change: Companies must remember the importance of understanding the connection between their bottom line and the environment. For example, an awareness of greenhouse gases, climate change, water and food scarcity, and ecosystems allows you to have a point of reference for the environmental impacts your own company is making. Social Change: Demographic change, population shifts, regulation changes, and innovations all correlate directly as implications of environmental change. Interested in learning more? Click here to watch the full webinar online or download the guide today!